Uttarakhand Public Service Commission, Haridwar has released new syllabus and examination pattern for forthcoming Pre and Main Exam of Uttarakhand PCS Examination. 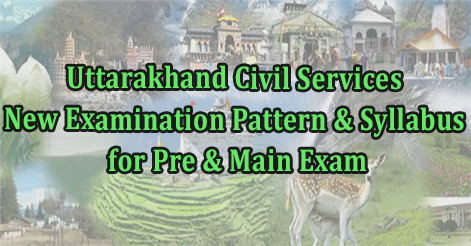 Candidates aspiring for the Uttarakhand Civil Services/ Upper Subordinate Services (PCS) Pre Exam (Objective) and Main Exam (Written) will have new examination pattern and syllabus. Note: Every question paper is compulsory and in Language Paper minimum 35% qualified marks is compulsory. Help us to improve this article/job posting "Uttarakhand PCS New Exam Pattern & Syllabus for Pre and Main". We would be glad if you can comment below and provide your valuable suggestions and feedback. If this page have any wrong information/list or out of context content, then you can report us as well. Hi Anyone knowing, when will the next notification for Uttarakhand PCS come this year 2015.
sir plz give me tips for the ukpcs exam pre and main…. ?how to prepration for this exam?? Pre is only qualifying or marks are added ??? Sir, 2016 mai kab form bhare jayenge Uttarakhand PCS k..kindly informed me and guide me. is ncert books enough or not? Ukpsc2014 mains papet kb hoga…. When will release the exam form for uttrakhan pcs??? Q-1. Kaya Pahle jo Pre leminary & Main exam Uttarakhan Public service commission ke liye choice subject hote the wo ab nahi hai? Q-2. Kaya ab sab ke liye ek hi tarah ka syllabus hai? Please send new syllabus and age limits and age relaxation for various categories and deparments. 2016 me UKPCS k form kab bhare jayenge? Admin kripya batayen ki ..
1—new syllabus me Jo 7 papers hone h, WO sabhi qualify krne honge? 2— Ab koi choice subject nahi rahega? Hlw sir a good evng to you ..
Sir prelims paper 2 ie csat paper ke marks bhi add honge? Sir what is the syllabus and books for preparing ukpcs examinations. Please tell in brief.